Some weeks ago, I started looking for my next destination. After lots of internal dialogue and price checking, I settled on Cambodia. Phnom Penh, to be exact. One of the things that I’ve grown fond of is extended layovers. Especially in places where visas are free. On the way to Cambodia, I was so fortunate. Flying from Chennai, I had to connect in Kuala Lumpur (Malaysia). When I booked the flight, I started looking for things to do in the city to take advantage of my fifteen hour layover. I found that Malaysia was known for having really good food. I also learned that Kuala Lumpur has a plethora of pasar malams, or night markets, filled with the aforementioned really good food. I had to go. This blog post helped me figure things out. After landing, I went to the city centre to check out the Petronas Twin Towers and walk around. By early evening, I was ready to let my tastebuds explore. I made my way over to the Taman Connaught night market. It’s massive. Like seriously massive. Like “go with friends and pace yourself with a bite of this and a taste of that because you’ll be overwhelmed with deliciousness” massive. There was a lot of pork, with a smattering of poultry. There were all different kinds of fruit (available whole, in pieces, juiced, and sometimes smoothied). With some dishes, noodles or rice played a prominent role. In many dishes, eggs featured generously. While most stalls had menu boards or signs in English, some did not. It’s an excellent opportunity to see if your eyes can figure out what your tastebuds desire. There were also stalls selling clothing, cell phone accessories, and other things. After two hours of walking through the stalls, I decided to call it quits. I had been gluttonous enough. I had eaten to my heart’s content. I was ready for a corner and a nap. If you ever have the opportunity to visit (and eat) at any of the night markets in Kuala Lumpur, do it! But pace yourself. For the market is mighty, and the stomach is small. The picture above is of one of the stalls serving salted egg things. P.S. – here’s a picture of me about to dig into something called salted egg chicken. It was pretty delicious. Recently, I’ve been checking out the south Indian state of Karnataka. Originally, I was planning to go directly from Goa to Hampi (in Karnataka). A lack of planning and information on my part led to that not happening. Commence an overnight bus to Bangalore, a day train to Mysore, and an overnight train to Hampi. Of course, I took time to explore each place. When talking to various folks, everyone kept saying that I must try a dosa. I had no idea what a dosa was. Some explained it as being like a crepe. Others didn’t explain it, and just described it as delicious. I have found both of these things to be true. Dosas are usually eaten as breakfast, or as a late afternoon/evening snack. There are different types of dosas. There’s the plain dosa, which is served without any filling or special seasoning. Then, there’s the masala dosa which is filled with some potato or veggie mixture. It also usually has some kind of seasoning mixture sprinkled on it. There’s also an onion dosa, which has chopped onion added during cooking before the batter has become bread. The onion dosa doesn’t have a filling. In addition to these, I’ve also had a something called a special masala dosa, which had a potato filling with extra seasoning. It was also nicely folded into a triangle. All dosas are served with some kind of saucy puree. I’m sure that there are other types of dosa as well, but I haven’t tried those (yet). While I’ve had my share of dosas over the past week, I have to say that my favorite was a masala dosa that I had in Mysore at Hotel Mylari. It was fluffy, like a pancake, and they didn’t skimp on the butter. It was simply delicious. I ordered two, one after the other, and was contemplating a third when I realized that I was being gluttonous. The picture above is of a masala dosa I had on V.V. Puram food street in Bangalore. I’m always looking for food recommendations when visiting new places. After the recent meditation course, I was speaking with a local woman. Naturally, I started asking her about any good food spots. She gave me a few options. Then, she proceeded to give me some of the best advice I’ve heard in a while. She suggested that if I was ever looking for delicious cuisine in any city, find out where the taxi drivers eat lunch. I’d never thought about this before. But it makes sense. Taxi drivers crisscross their cities. That’s not only true in terms of geography, but includes culture and socio-economic status. While the lunch spot probably isn’t going to be the fanciest, it typically will be tasty and affordable. That’s pretty much all I need. Usually, I’ve followed the advice to eat wherever I see large crowds of locals. I’ll still do that. I’d just never thought about taxi drivers as resources outside of a city’s geographical stuff. Special thanks to Shweta for the advice and sharing your Goa. I love food. Especially good food. It’s one of my main reasons for traveling to new places. Street food is an exceptional favorite. Walking around to take in the sights and sounds gets enhanced by the smells. Since I arrived in India, I have learned that most of what the western world eats as Indian food comes from northern India. As a very large country with different cultures, languages, and people, Indian cuisine is more than curries, biryani, and naan. Each of the states have their own culinary traditions. Since arriving in India a little more than a week ago, I have kept my eyes and nostrils open for potential street food adventures. The collage above features some of the street food I ate during my first week in Mumbai. While roaming the city, I try to notice street food places where many people are congregating. Though not always true, popular can insinuate good taste. In the top left is a dish that I can’t remember the name of, but it is traditional served as breakfast in Mumbai and surrounding regions. The sauce is soupy and spicy, but the spice is a slowly building, subtle spice. Moving clockwise, this snack is known as vada pav. A roll is spilt to allow a spicy chutney and a dab of other chillies to put on the bread. The roll is then filled with fresh, hot fried potatoes that have been coated in a light batter. This roll was exceptionally delicious. Continuing clockwise, this is a dessert/snack and I’m not sure of its name. It’s some kind of fried dough and it’s extremely sweet. Like biting into concentrated sugar. It reminded me of the South African dessert, koeksister. Lastly, there’s the amul dabeli. It’s a small sandwich that starts with some spicy chutney spread on the bun. There’s a mixture of stuff that goes into the sandwich filling including a spicy potato mixture, pomegranates, and cilantro. It’s a decadent mix of spicy and sweet without being too much of either. So far, this might be my favorite of the street foods that I have experienced. 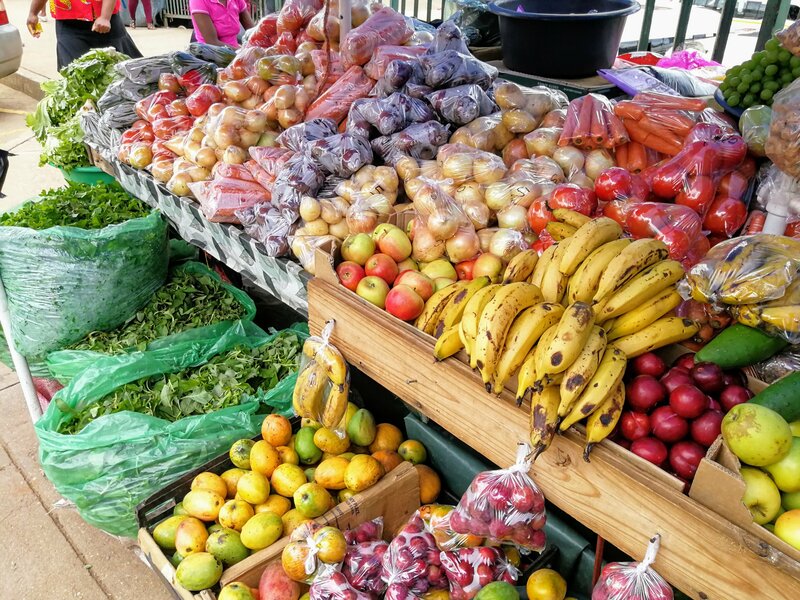 When it comes to grocery stores, there are a few options around eSwatini. In the southwest town of Mankayane, there are a few grocery stores. These are smaller, independent grocery stores. Around eSwatini, there are four large chain grocery stores including Shoprite, Pick n Pay, Spar, and Boxer. There’s a smaller version of Shoprite in some places called U-Save. Some cities have a Super Spar. All four large chain grocery stores will typically have a bakery, a butcher, and a hot food bar. I tend to do most of my shopping at Shoprite for a couple of reasons. First, they have many locations, especially in the places I frequent in eSwatini. Second, it’s cheaper than some of the other grocery options, for the things I buy. Third, there are some products I love that are only available at Shoprite including the store brand oats and Frimax’s Sweet Chili potato chips. I think Pick n Pay has the best hot food bar with Spar running a close second. Spar’s bakery features fresh made doughnuts, which are absolutely delicious. If the store sells alcohol, it’s typically done in a separate, lockable, section of the grocery store or it’s a separate store all together. The above picture was taken outside of the Shoprite entrance in Ezulwini. One of the greatest ways to experience a place is through its food. Swaziland’s street food culture features a few staples. One of the meals that can be found all around Swaziland is chicken dust. Chicken dust is a grilled chicken quarter typically served with a maize porridge known as lipaleshi (pronounced lee-pah-lee-she), or pap, and salad. Some chicken dust stands give the option of fries or rice. You may be wondering why it’s called chicken dust. The short answer is: I don’t know. I suppose that it may be because of the placement of chicken dust stands on the side of the road where dust can be kicked up by passing cars. But again, I don’t know. Chicken dust is a good, quick lunch or dinner that will cost 20-25 emalangeni. While I haven’t experience all chicken dust places in Swaziland, I’m confident that the best chicken dust can be found in Mankayane across from the bus rank. They give the option of pap or rice to accompany their flavorful, juicy chicken. Be sure to treat yourself to this Swazi delicacy if you’re ever in the neighborhood. The above picture features the delicious chicken dust from Mankayane. I’m writing this on the Saturday before Christmas. There are two times every year when people return to their respective family’s homestead. Good Friday/Easter is one of those times. Christmas is the other. Several extended family members from my host family have returned to my gogo’s (pronounced go-go), or grandmother’s homestead to celebrate Christmas. Two days ago, my family slaughtered a cow and sent it to the butcher. My host make (pronounced mah-gay), or mother, told me that I should be a gogo’s homestead on Saturday for a family gathering. 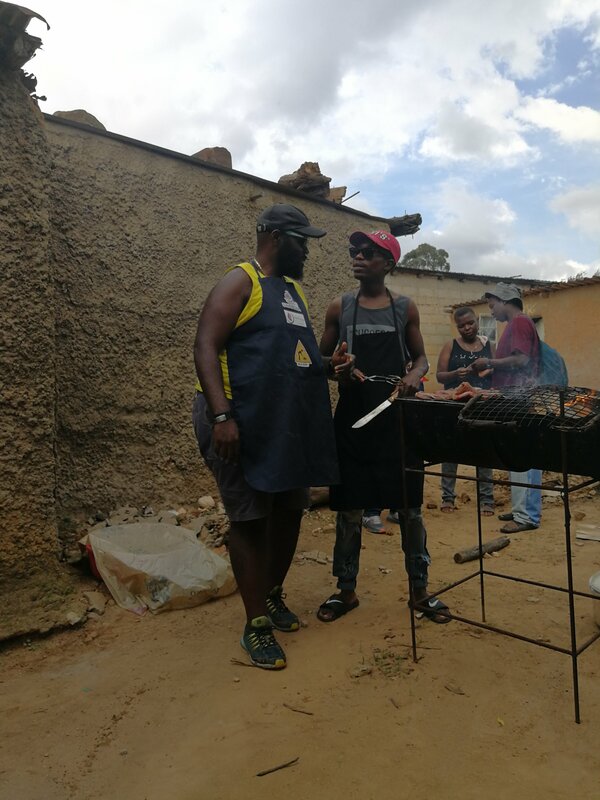 My host bhuti (pronounced boo-tee), or brother, asked me to help him braai the meat. I was honored to be asked to assist. This morning, my bhuti knocked on my door to let me know that it was time to start the festivities. We went to the store to pick up some spices and beer. When we returned to gogo’s homestead (down the road from my homestead), some people had already arrived. Some of our cousins had started the fire in the braai stand already. I grabbed my apron while my bhuti seasoned the meat. There was at least 10 kilograms of beef to be grilled. It had been a while since I’d been at the helm of a grill, and it was my first time using a braai stand. Luckily, the concept and function is the same. As grilling commenced, people slowly gathered around. I spent most of the afternoon on the braai stand, and I was extremely happy. My bhuti made sure that I took breaks so that I could enjoy the food as well. There’s a certain magic that occurs when good people gather for a good time with good food. Imagine a block party meeting a family reunion mixed with Christmas dinner. That was today. The speakers blasted tunes as folks danced after they ate. Home brewed beer flowed freely. Community members, friends of the family, and friends of friends came over for food and fellowship. Today was a good day. It’s one of those days that makes me happy to be a part of this human experience. I’m thankful that I have been welcomed and embraced into my family, community, and all of Swaziland. The above picture of me and my bhuti doing/discussing braai things. Swaziland has a huge agricultural society. In the rural community, almost every family has a field or two for the purpose of growing food. If you happen to live in a more urban setting and/or lack agricultural savvy but still want fresh fruits and veggies, you’re in luck. At bus ranks and other places where many people congregate, there’s likely many bomake (pronounced bo-mah-gay), or women who have set up temporary stalls with an abundance of whatever fruits and vegetables are in season. The prices are typically very reasonable and it presents the opportunity to support small business projects. The above photo was taken outside of the Mbabane bus rank last week. As you may see, mangos are now in season! This is reason to celebrate. Because I am posted in a country where I might contract malaria, I have been given an antimalarial medication called, “Mefloquine”. One of the side effects of this medication is lucid dreaming. The following is what I dreamt last night (as best I can remember). There was a seafood restaurant. They had shrimp. There was another seafood place that only had soft shell crab. But they had run out of soft shell crab. I ordered one, and they somehow managed to get it for me. I had to wait for the long bus ride home. A few days later, I found out that I would be moving to a house closer to the seafood places. I was excited. The house was similar to a college dorm suite with two people sharing a room on either side of an elaborate kitchen/dining room setup. I didn’t like my roommate because he walked around with a 25 liter jerry can that served as his personal urinal. We had multiple bathrooms in the house. Because I now lived closer to the seafood places, I would go there often. Maybe everyday. One day, I saw that they were supposed to have stuffed shrimp. Of course, they had run out by the time I got there. I had to order the regular shrimp. I went to another shop in the vicinity to order cake, but they didn’t have any red velvet cake left. I walked home slightly disappointed that I didn’t have stuffed shrimp and red velvet cake. Ever wonder what is Kirby doing? Follow the blog! Living in Swaziland has taught me many things, and reaffirmed others. One of the things that has been reaffirmed is the heavy influence of American culture on Swaziland. In particular, American hip hop culture influences many across the kingdom. Some of my students want to know my personal familiarity and acquaintance with John Cena, Beyonce, and Rick Ross among others. I’ve helped friends in my community to get updated music from their favorite artists. Just outside of the Swazi metropolis known as Manzini, there is a town called Matsapha. 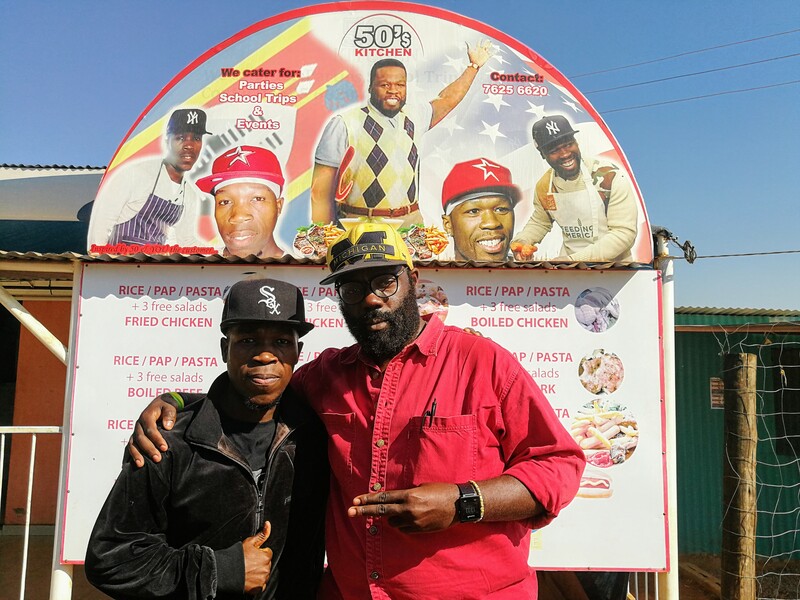 While Matsapha is home to an array of businesses and restaurants, one business meshes American hip hop culture and Swazi cuisine. The eatery’s name is 50’s Kitchen. The restaurateur is definitely 50 Cents’ doppelganger. But he doesn’t rest on his resemblance to his famed American twin to garner business. The food is delicious and affordable. If you ever find yourself in Matsapha, or even Manzini, definitely stop by and enjoy the culinary delights.